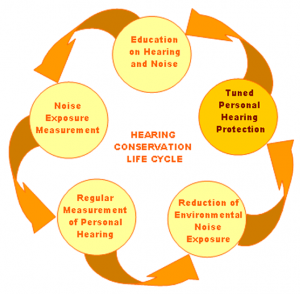 Home › News › Hearing Conservation…Protecting workers from noise exposure? What you need to know about occupational noise exposures? Noise, or unwanted sound, is one of the most common occupational health problems. It is a by product of many industrial processes. Sound consists of pressure changes in a medium (usually air), caused by vibration or turbulence. These pressure changes produce waves emanating away from the turbulent or vibrating source. Exposure to high levels of noise causes hearing loss and may cause other harmful health effects as well. The extent of damage depends primarily on the intensity of the noise and the duration of exposure. 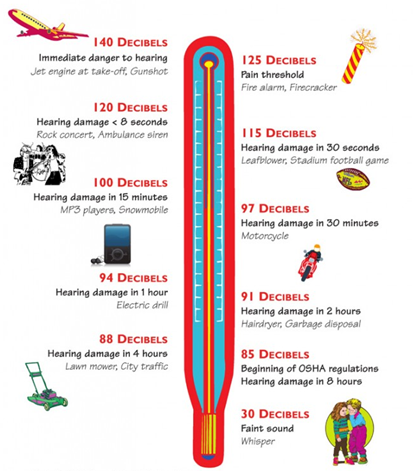 Noise-induced hearing loss can be temporary or permanent. Temporary hearing loss results from short-term exposures to noise, with normal hearing returning after period of rest. Generally, prolonged exposures to high levels over a period of time gradually causes permanent damage. The hearing conservation program requires employers to monitor noise exposure levels in a way that accurately identifies employees exposed to noise at or above 85 decibels (dB) averaged over 8 working hours, or an 8-hour time-weighted average (TWA). Employers must monitor all employees whose noise exposure is equivalent to or greater than a noise exposures received in 8 hours where the noise level is constantly 85 dB. The exposures measurement must include all continous, intermittent, and impulsive noise within an 80 dB to 130 dB range and must be taken during a typical work situation. This requirement is performance-oriented because it allows employers to choose the monitoring method that best suits each individual situation. Employers must repeat monitoring whenever changes in production, process, or controls increase noise exposure. 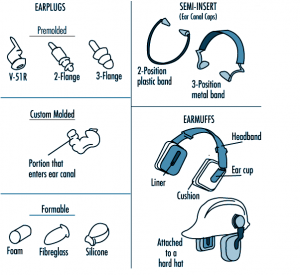 These change may mean that more employees need to be included in the program or that their hearing protectors may no longer provide adequate protection. Employees are entitled to observe monitoring procedures and must receive notification of the results of exposures monitoring. The method used to notify employees is left to the employer’s discretion. Calibration of devices used to measure noise is Important!!!! Employers must carefully check or calibrate instruments used for monitoring employee exposures to ensure that the measurements are accurate. Calibration procedures are unique to specific measurements. Employers should follow the manufacturer’s instruction to determine when and how extensively to calibrate the instrument. Audiometric testing monitors an employee’s hearing over time. It also provides an opportunity for employers to educate employees about their hearing and the need to protect it. The employer must establish and maintain an audiometric testing program. The important elements of the program include baseline audiograms, annual audiograms, training, and followup procedures. The audiometric testing program followup should indicate whether the employer’s hearing conservation program is preventing hearing loss for a workplace at or more than 85dB. A licensed or certified audiologist, otolaryngologist, or other physician must be responsible for the program. Both professionals and trained technician may conduct audiometric testing. The professional in charge of the program does not have to be present when a qualified technician conducts tests. The professional’s responsibilities include overseeing the program and the work of the technicians, reviewing problem audiograms, and determining whether referral is necessary. The employee needs a referral for further testing when test result are questionable or when related medical problems are suspected. If additional testing is necessary or if the employer suspects a medical pathology of the ear that is caused or aggravated by wearing hearing protectors, the employer must refer the employee for a clinical audiological evaluation or ontological exam, as appropriate. There are two types of audiograms required in the hearing conservation program: baseline and annual audiograms. Baseline audiogram is the reference audiogram against which future audiograms are compared. Employers must provide baseline audiograms within 6 months of an employee’s first exposure at or above an 8-hour TWA of 85 dB. 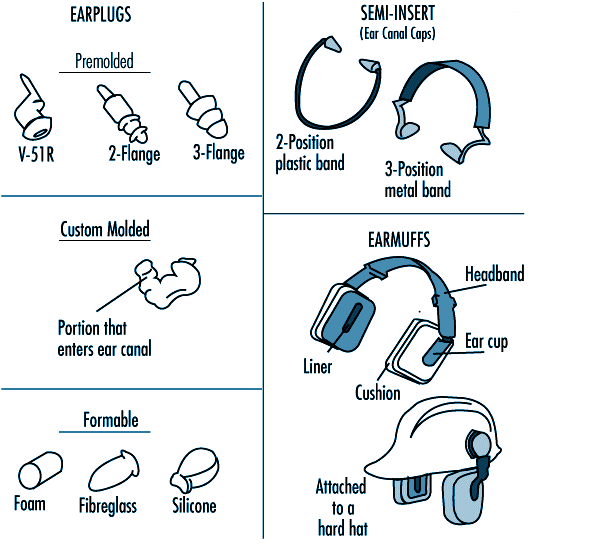 Employees, however, must be fitted with, issue, and required to wear hearing protectors whenever they are exposed to noise levels above a TWA of 85 dB for any period exceeding 6 months after their first exposure until the baseline audiograms is conducted. Employees should not be exposed to workplace noise for 16 hours before the baseline test or wear hearing protectors during this time period. 3. Employers must provide annual audiograms within 1 year of the baseline. It is important to test worker’s hearing annually to identify deterioration in their hearing ability as early as possible. This enables employers to initiate protective followup measures before hearing loss progress. Employers must compare annual audiograms to baseline audiograms to determine whether the audiogram is valid and whether the employee has lost hearing ability or experienced a standard threshold shift (STS). An STS is an average shift in either ear of 10 db or more at 2,000, 3,000 and 4,000 hertz. 4. Employers should provide personal protective equipment (PPE eg. ear plug, ear muff) for workers exposed to 8-hour TWA noise levels of 85dB or above. And ensure workers have access towards it. And workers must wear hearing protectors and should be trained to understand the reasons for the hearing conservation programs and the need to protect their hearing so that they will be motivated to wear their protectors and take audiometric tests. 5. Further, employers must keep noise exposure measurement records for 2 years and maintain records of audiometric test results for the duration of the affected employee’s employment. Audiometric test records must include the employee’s name and job classification, date, examiner ‘s name, date of last acoustic or exhaustive calibration, measurements of the background sound pressure levels in audiometric test rooms, and the employee’s most recent noise exposure measurement.